We had so much fun making this. We shopped at many stores looking for anything related to ducks or bright colored items. Anything goes with these. We used the basics instructions that were posted on this site to assemble. The rest was just whatever we found on our shopping trips. Let your creativeness shine! I found this cake interesting and useful. Made by a pro! I will bookmark your blog and check again here frequently. 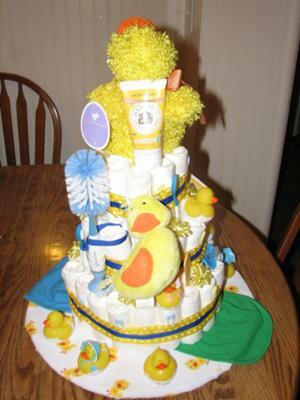 I am quite certain this is the best diaper cake gallery on the web! We used the basics instructions that were posted on this site to assemble. The rest was just whatever we found at the craft store. Turned out awesome! Beautiful and cute! 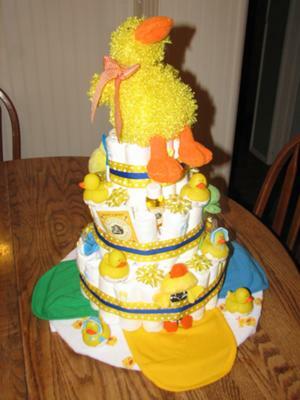 The small ducks and the big one at the top are perfect.